Neptune's Laboratory Mixers are available in air or electric drive with clamp or bracket mount. The air motors include a control valve and muffler. Shaft and Prop 316SS. 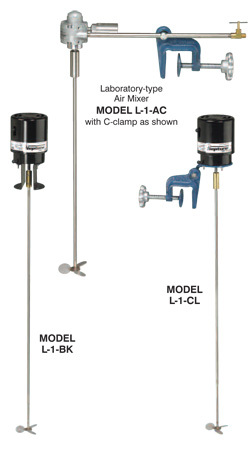 Model L-1-AC includes a C-clamp and the air supply pipe passes through the C-clamp. Model L-1-A does not include a C-clamp but the air supply pipe will fit a standard one-half-inch laboratory bar clamp. Cord and plug are standard with 1550 rpm electric models. Operating speed ranges from 200 to 2000 rpm with air motors. L-1-CL 1/20 HP-115-60 "C" Clamp 1550 30" 3" 5/16"
L-1-CL 24 1/20 HP-115-60 "C" Clamp 1550 24" 3" 5/16"
L-1-CL 18 1/20 HP-115-60 "C" Clamp 1550 18" 3" 5/16"
L-1-BK 1/20 HP-115-60 Bracket 1550 30" 3" 5/16"
L-1-A *HP Air Motor Lab Clamp Variable 20" 3" 5/16"
L-1-AC *HP Air Motor "C" Clamp Variable 20" 3" 5/16"